Written by Will on April 12, 2012 and posted in Gaming Merchandise. 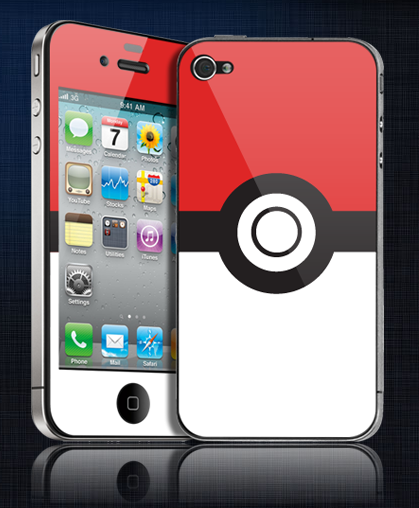 Here's the sweet iPhone 4s Pokeball Skin that initially caught my eye. I seen this Pokeball phone skin the other day for an iPhone 4s but as it turns out they have printing facilities that can accommodate thousands of different devices. Tablets, Phones, Games Consoles, Laptops, iPods, MP3 Players, Games Controllers you name it they print it. They custom print your vinyl exactly to size for your device and then pre-cut it to ready to peel and stick and I must say that this Pokeball one looks sweet. They do print a whole range of other decals too and they also do custom designs. Check them out over at customphoneskins.com. I wanted to get one of these but I don’t have an iPhone so I planned to get it for my Samsung Galaxy Tab 10.1 tablet but I was astonished to find that they only print the 7″ model of the Galaxy Tab, but oh well they print it for my phone model and that will do me nicely :). Here’s a few of the other designs from the Homepage of their site. Here's a few examples of what you can have printed for your device.